Deaf Action Center is committed to providing those who are deaf and hard of hearing the means to ensure advancement through education, economic security, and good health. "It took persuasion and perseverance to show one of our first residents that he was not abandoned within a community that advocates for accessible communication and social support." Today, at the age of 83, he is thriving at Martha's Vineyard Place. "A deaf senior citizen in need of major heart surgery did not understand her options as her doctor wrote brief post-it notes to explain. Sent home with a pamphlet and insufficient explanation, she opted out of the surgery until coming to DAC. DAC informed her that she needs full communication access to make informed choices. We advocated for her rights to have full access with a sign language interpreter. With proper access, she understood her choices and opted to have life saving surgery." 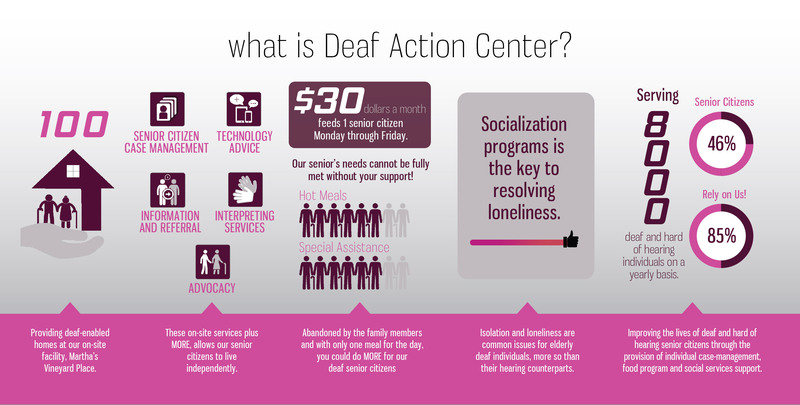 As a neighbor living the last 41 years within this area, you have probably seen the Deaf Action Center. Come and learn more about how you can be involved! For anyone, it is possible. The staff at DAC and MVP have worked together in successfully securing a place for Rosa to live within her community. Her family felt secured and convinced enough to believe that their Deafblind daughter is independent. And that she would no longer feel isolated and to receive advocacy support, daily meals, and transportation.